I know, I'm really late with writing my cards this year. Especially as in the interest of being frugal I prefer to send them second class. I tried to make a bit of a stand this year, as in the past I feel that I have spent a lot of time effectively exchanging cards with the wives of my husband's friends. This year I told my husband "I've got the Christmas cards out for you so that you can write them to your friends". Of course I know that I'll end up writing them out anyway as I'll feel bad when they don't get done. Not being at work does mean that my list has reduced this year. I do like to send them to my mummy friends at baby groups, which means I have to try and remember the names of their husbands to put on the card, to avoid writing "Dear X and family" when they have managed to remember mine. 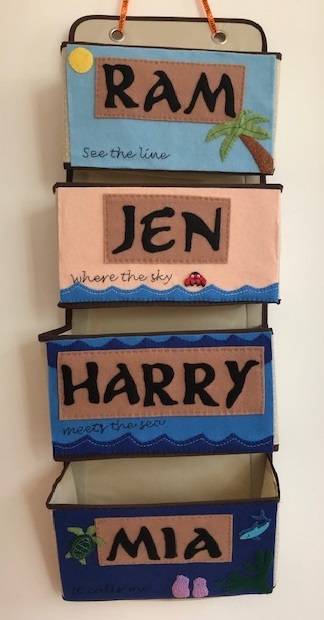 At Harry's nursery, they distribute a list of the names of all the children in his room to make sure that you don't miss anyone. As he only attends for a day and a half a week, I'm sure that he never meets most of these little ones. Today he was delighted to come home with two cards (especially the one that contained a chocolate coin), but when I asked him who the two little girls were that had sent them whose mother had sent them he didn't know! I used to make a special effort with each card and include an extra handwritten greeting, or even enclose an individual letter with our news. But then I discovered that most people just sign their names. Especially with everyone being so connected on Facebook and the like I tend to know what everyone else has been up to anyway. I wouldn't want to stop sending cards altogether though, it's always nice to have a reminder of a friend pop through the letter box and I appreciate every one that I receive. I just need to get together the motivation to get on and write them!